At 7' 6" (2.29 m), retired Chinese professional basketball player Yao Ming dwarfs this orphaned baby elephant. 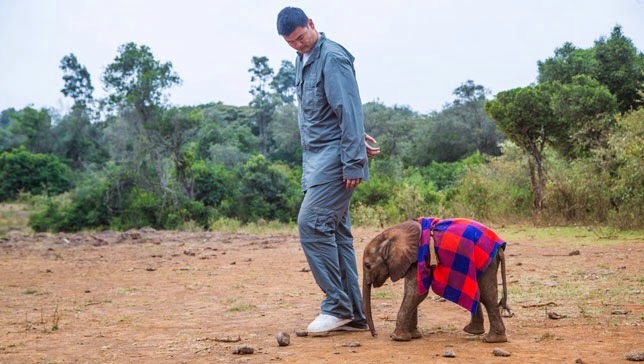 Yao has partnered with Animal Planet (appearing in a special that airs on November 18th) and conservation organization WildAid. He has already succeeded in decreasing consumption of shark fin soup in his home country. Now he is using his celebrity status to eliminate the economic incentive to poach elephants and rhinoceros by curtailing desire in Asia and worldwide for ivory objects and powdered rhino horn. Yao relates, "Before, it was more of a number for me…too abstract. When I visited Africa, it became very real to me. I developed a special connection with the animals that I met." And he qpoints out, "We all have to do our part, and I'm trying to do mine. These are not only amazing creatures; they also are an important part of Africa's ecosystem. It's tragic that these animals are among the last of their kind and are being killed for no good reason. People don't need ivory. It's a luxury item, one that is shameful to own once you know an elephant died for it. Same with rhino horn: people take it as medicine, but it’s as medically beneficial as chewing on your fingernails."